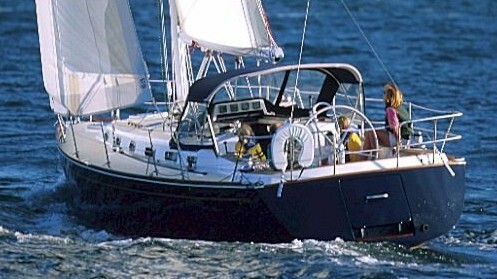 The Tartan 4700 has a layout and design that accommodates all members of the family, but the boat can still be sailed short-handed. Like Goldilocks, a few Tartan customers had a dilemma: nothing in the company's lineup quite fit their needs. Models like the new Tartan T 4000 and the 4400 were too small, but the company’s flagship 5300 was too big. So a few of them approached chief designer Tim Jackett and asked him to create something that would satisfy the family cruising sweet spot. 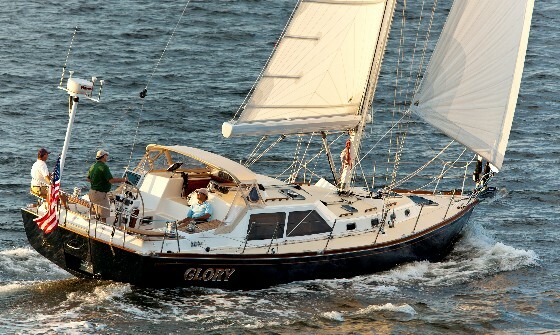 The result was the 4700, hull number one was named Glory, and it went to an owner who likes to sail with his kids on Long Island Sound. The 4700 incorporates many of the trademark Tartan features, and has a three-cabin layout that should work well for sailing families. The 4700 is pure Tartan, from the sweeping lines to the interior joinery to the company’s Cruising Control Rig (CCR). 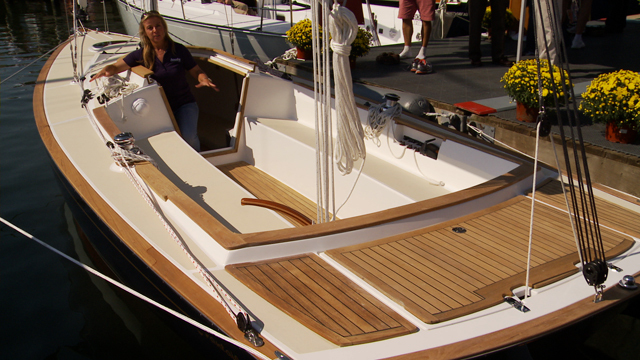 Using the 4400 served as a starting point, Jackett added three feet to the overall length and kept the wide transom. The new 4700 is a moderate displacement, raised saloon design with a cut-out transom that drops down to form a swim platform for good access to the water. Still present are Tartan trademarks like the fractional rig with a 100% self-tacking jib and a 150% reacher on roller furling. 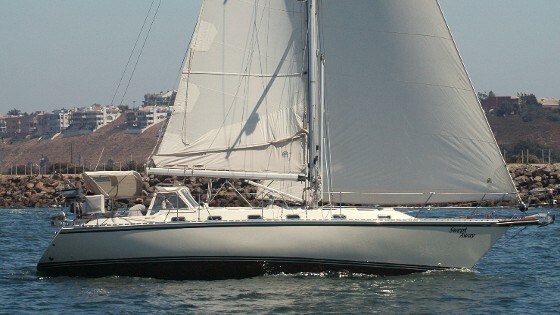 The tall mast is carbon fiber and tapered to save weight aloft, and the keel is available with the beavertail bulb or a deep fin. The 4700 also comes standard with the Tartan pocket boom and integrated lazyjacks, but an in-boom furling system is available. 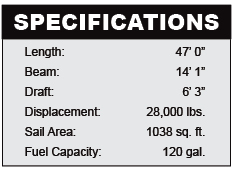 The hull is foam-cored and vacuum-bagged with a good glass-to-resin ratio for strength. The deck is cored with end-grain balsa. The three extra feet of hull added a lot to the interior and the 4700 is a three-cabin, two-head boat. The master stateroom is still forward but is a little smaller, so a third over/under bunk cabin for kids or crew could be added just aft of the small head to starboard. Like on the 4400, the galley is to port and is forward of the saloon, which is a unique Tartan feature. The dinette is circular and will seat four comfortably, or six with added folding chairs. 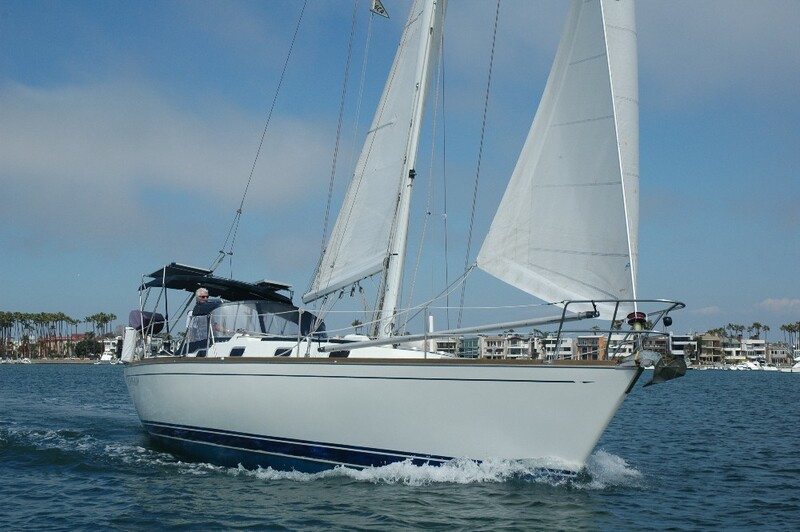 A forward-facing nav station is by the companionway just ahead of the second and much larger head with a stall shower. 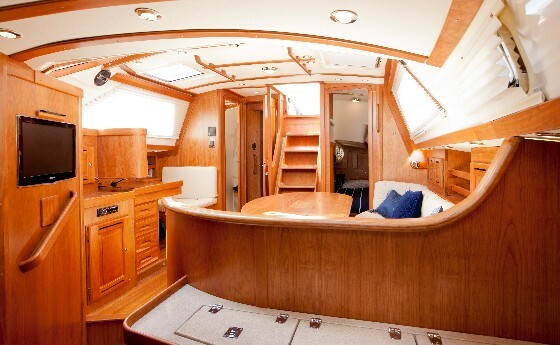 The aft cabin is now much larger, with stand-up headroom at the foot of the bed. The engine and genset are below the raised saloon sole and are accessible for maintenance. Tartan’s exquisite joinery fills the warm cherry interior. Everywhere you look is a satin finish with raised panel cabinetry and dovetailed drawers. With plenty of white surfaces and huge saloon windows which you can see out of even when seated, the interior is aglow. A satin-finished cherry interior sets the Tartan apart from its competition. 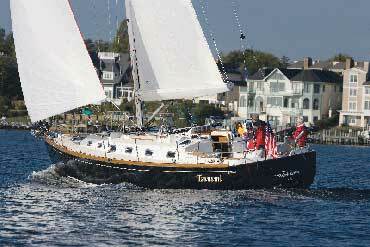 Tartan does an excellent job of understanding how people, especially serious cruisers, use their boats. 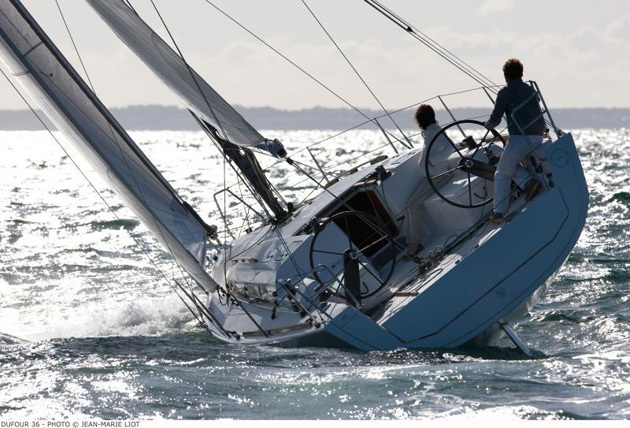 For example, electric winches abound with switches within reach of the helm for shorthanded sailing. Marelon thruhull fittings are used so there is no greasing or potential for corrosion, and various valves and manifolds are easily accessed under the galley sink. A two kW inverter is standard, as is an over-sized alternator and 450 amp hours of battery power. With equipment like this and the family-friendly design, the 4700 will prove ideal for many different types of cruising sailors. 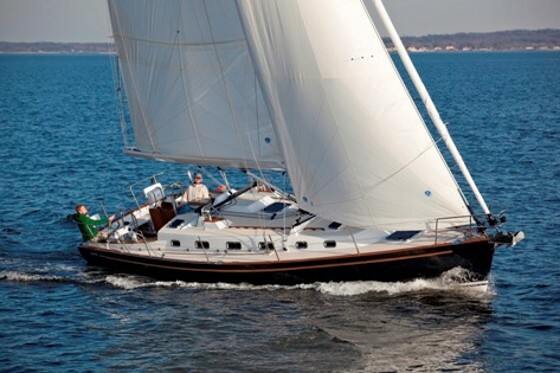 For more information, visit Tartan Yachts.